NEW COMPANY, HIGH MODERN HOMES , MEETS GROWING GLOBAL DEMAND FOR MODERN HOME DESIGNS. 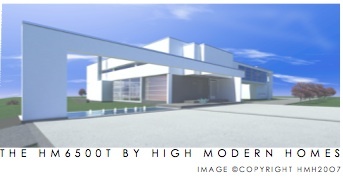 High Modern Homes announces the first ever offering of affordable, minimalist modern home designs and plans on the web. The desire for modern home designs is growing rapidly across the world. In America the most rapidly expanding home buying demographic is young and sophisticated. These sophisticates read Metropolis, Dwell, Abitare and Metropolitan Home, among others and they just aren’t excited by the stock neo traditionalist design fare currently available. In other parts of the world residential modernism has already accelerated. While modernism has long been in demand and available at the very exclusive high-end of the market it has not yet found it’s way into the standardized process by which the majority of people acquire their new homes. High Modern Homes now makes high-end contemporary design affordable and accessible to a new generation of homeowners. The top professionals, architects, designers and digerati, who have founded High Modern Homes also work on those exclusive custom homes. “The challenge is to make available quality modern design plans, ( builder ready), to the mainstream housing industry” says Thomas Mont Alto, AIA co-founder and Lead designer of HMH. America’s home building dynamo is already very good at making traditional design styles widely available. The industry does this by providing standard plans and spreading the cost of design over many homes instead of one. The designs offered by High Modern Homes, because of their very simplicity, openness and order, will be easily absorbed and constructed by professional home builders. “What we need now is, simple, modern design that can be built affordably. We are well into the twenty-first century and it’s high time that some clean, simple, efficient and beautiful modern design made it’s way into suburban America” says Mont Alto. High Modern now offers it’s first ten homes under the title of the Foundation Series. The company intends to expand its product line every year adding models with a strong focus on high quality design and excellent, clear blueprints. "There are thousands of house plans available for sale today yet there are virtually no modern homes and not one company is dedicated to true, architect designed, high quality Modern Design plans. The simple truth is, this has never been done before and it’s exciting to meet this need." says MontAlto. IT’S TIME! HMH can be contacted by e-mail at info@highmodernhomes.com or by phone at 330.659.2058. HMH is founded on the belief that the way we live now should reflect the new century. Lets look ahead with style, efficiency and sustainability and still include all the lifestyle amenities we expect from our homes. High Modern Homes was founded by Thomas P. Mont Alto AIA, RA, NCARB, architect and creator of Design Acceleration, enhanced project delivery system for high end architectural projects and Joseph J. Bayer RA owner and founder of Architechnology a cutting edge 3D, design and animation studio serving the architectural, interiors, manufacturing and building industries. Both gentleman have long been concerned with bringing modernism into the mainstream of availability.